Clinicians are among the most credible messengers on the importance of environmental protection and climate action. All of us can think of doctor or nurse we’ve interacted with at some point, and who we trusted enough to turn to for help and guidance when we’re sick. During the Flint Water Crisis, pediatrician Dr. Mona Hanna-Attisha raised the alarm on the toxic levels of lead showing up in the children she served. Clinicians are often on the front lines of dealing with the consequences of an unhealthy environment and how that makes our families and communities unhealthy as well. 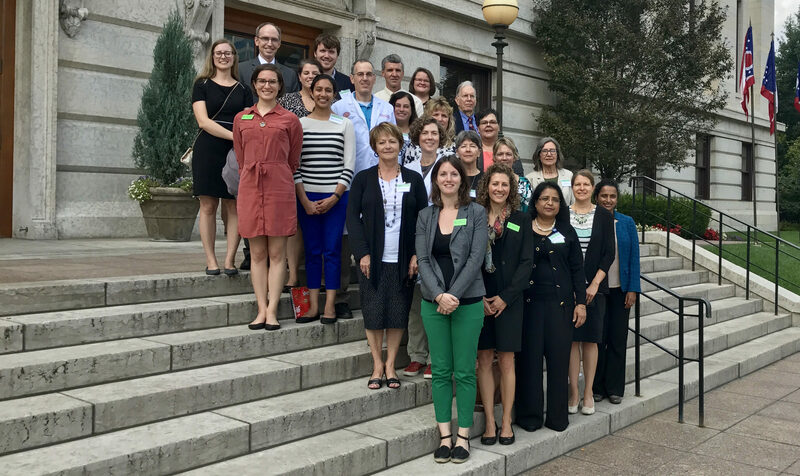 Ohio Clinicians for Climate Action is a statewide group of doctors, nurses, and other health professionals who know that how we treat the environment affects our health. OCCA clinicians regularly advocate for their patients through offering credible, health-based perspectives on environmental policy. You will find OCCA participants in your local paper, in the halls of the Statehouse testifying against efforts to roll back clean energy progress, and on social media raising awareness about the way clean air, water, and land affects the overall well-being of Ohio families. We are expecting a renewed effort to eliminate Ohio’s clean energy standards in the fall of 2017 and early 2018. Reinstating Ohio’s clean energy standards in 2017 is preventing 2,230 asthma attacks, 230 heart attacks, and 140 premature deaths. Between the years 2017-2029, those numbers increase 20-fold. Clean energy is a critical public health issue. Lake Erie and the Ohio River are a major source of drinking water, yet remain severely polluted from industrial agriculture pollution. In order to protect Ohioans’ drinking water we’re calling on state lawmakers to pass stronger protections against industrial agriculture pollution in Ohio’s waterways. Parks and recreation programs and services contribute to the health of children, youth, adults, and seniors. Unfortunately, Ohio has limited public lands and special interests are attempting to open these lands up to industrial scale fracking and the air and noise pollution that come with it. Ohioans need access to outdoor places to stay healthy!